I am not a morning person. 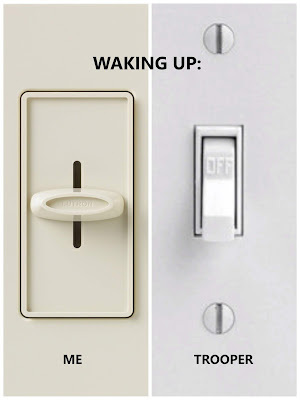 I hit the snooze button at least 2-3 times before rolling out of bed. I enjoy the stillness of a quiet morning. I don't like to make decisions before coffee. I don't like conversation before coffee. TBH, I don't like people before coffee. (Not that I like people much better after coffee.) I need time to warm up to the world. Trooper is a morning dog. Until we got him, I didn't know there was such a thing. Trooper can't wait to start the day. My alarm goes off at 5 AM. Several days a week he's in my face at 4:45 -- just because. It's a cruel, cosmic joke. 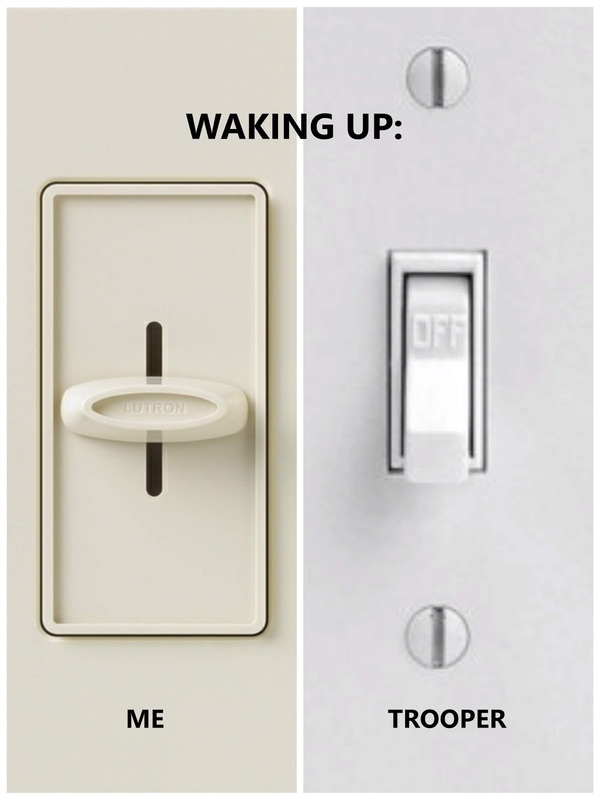 I made this meme to illustrate, though in reality Trooper's switch would be spring loaded. I try not to get too annoyed with Trooper. He's a sensitive dog and his feelings get hurt easily, so I try to contain my displeasure to a couple aggressive grunts. P.S. Funny Fact: Jedi knows I'm not a morning person. If he has to go out in the middle of the night he wakes Hubby. Good boy, Jedi! I'm a morning person. I wake up, get out of bed and am ready to rock and roll. I wasn't always that way, but I am now. Trooper and I would get along very well.